The 2019 Monster Energy NASCAR Cup Series kicks off at Daytona (Fla.) International Speedway with the 61st running of the Daytona 500 with Daniel Suárez piloting the No. 41 Haas Automation Ford Mustang for Stewart-Haas Racing (SHR). This season marks Suárez’s third year behind the wheel of a stock car in NASCAR’s most elite series for the Monterrey, Mexico native. The 27-year-old Suárez is looking for a “Haas-ome” year, which in just a little more than a month has already been a busy one. On his birthday, Jan. 7, it was announced he would be the driver of the No. 41 Haas Automation/ARRIS Ford Mustang. Shortly after the announcement, Suárez headed out to California for a quick media tour and then on to Auto Club Speedway in Fontana for a two-day Goodyear tire test Jan. 9 and 10. The test signified the first time the Mexico native was behind the wheel of the No. 41 Mustang and his first time working with his new team. Suárez will pilot the black-and-red Haas Automation Ford Mustang for Daytona Speedweeks. Haas Automation is America’s leading builder of CNC machines and owned by SHR team co-owner Gene Haas. In addition to Haas Automation, the No. 41 Ford Mustang will also feature ARRIS International PLC for a portion of the season. In 2016, Suárez captured the Xfinity Series title with support from ARRIS. The No. 41 crew remains intact for 2019 after a successful campaign in 2018. Billy Scott, a native of Land O’Lakes, Florida, continues to lead the Haas Automation team as crew chief. Scott and the No. 41 team most recently visited victory lane at the Bristol (Tenn.) Motor Speedway race in August 2018. The veteran crew advanced to the Round 8 in last year’s NASCAR playoffs and captured a series-leading five pole awards. Before running in the 61st “Great American Race” on Sunday, Feb. 17, Suárez will participate in the Advance Auto Parts Clash this Sunday. He gained entry into the 75-lap exhibition race by winning his first career Cup Series pole award at Pocono (Pa.) Raceway in July 2018. This season marks Suárez’s second time running the event with his most recent start during his 2017 Cup Series rookie campaign. He brought home an eighth-place finish. Suárez is the newest driver among SHR’s four-car contingent, joining veterans Aric Almirola, Clint Bowyer and Kevin Harvick. 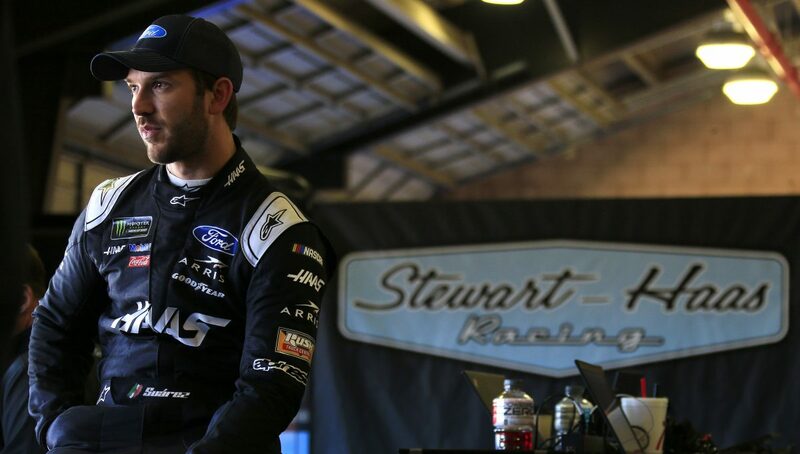 The new Ford driver is looking forward to getting to know his teammates better and being an integral part of the two-time championship-winning organization, which is coming off of its most successful season since its inception. Among his many goals for 2019, Suárez is looking to improve his record at superspeedways. With three of his four previous superspeedway starts in the Cup Series resulting in accidents, SHR might just turn his luck around. The SHR organization pulled off the amazing ability to stick together throughout almost the entire race during the fall race at Talladega (Ala.) Superspeedway last year and Almirola went on to claim the victory. As a whole, SHR led 155 laps that day and looks to have the same success at the season-opening Daytona 500. With several rules package changes, a new manufacturer, new car model and a new team, the 2019 season begins a year of change for Suárez and his Cup Series career. What’s it like to work for Tony Stewart? What has your experience been like working with Billy Scott, so far? How challenging is it switching manufacturers? What are you looking forward to at Stewart-Haas Racing? How did your first test go with the No. 41 team?